Why are labels necessary to guarantee fair trade practices? How are the ten basic fair trade principles integrated into fair trade programs? With which requirements must traders and processors in northern countries comply? How is the compliance with fair trade requirements monitored by the certification schemes? Are the certification processes relevant enough to ensure that the basic fair trade principles have been fulfilled? What are the distinctive features of fair trade labels? What do we know about the impact of fair trade? These are some of the questions addressed by the International Guide to Fair Trade Labels, the result of an international collaboration between four partners: French Fair Trade Platform, Fair World Project, FairNESS France and FairNESS UK. Published in early 2015, the guide is a useful tool for professional purchasers, public and local authorities, and consumers’ associations needing updated information on fair trade labels. New labels have emerged such as: SPP, for which only organized, small-scale producers are eligible, and which attempts to reclaim the values of the movement; and Fair Trade USA which attempts to open it up to unorganized producers and more plantations. Others have merged: ECOCERT and Fair for Life. One label changed long-standing policies to open its certification scheme up to new actors: Fairtrade International with the launch of its Fairtrade Sourcing Programs. Another strengthened its monitoring measures: WFTO. Regulations on fair trade have recently evolved and now allow purchasers to demand a private sustainable development label as proof or evidence of compliance with their social and environmental requirements (European Directive on public procurement, January, 2014). The proliferation of sustainability labels and the lack of visibility regarding their requirements have caused confusion among consumers and professionals, which has in turn increased the demand for concrete proof of fair trade impact. The guide studies eight labels/guarantee systems claiming to be fair trade: ECOCERT Fair Trade, Fair for Life (IMO), Fairtrade International (FLO), Fair Trade USA, Forest Garden Products, Naturland Fair, Small Producer Symbol (SPP) and World Fair Trade Organization (WFTO). Along with an analysis of the content of the various fair trade standards, the guide focuses on the monitoring measures implemented by these schemes to control compliance with their requirements. 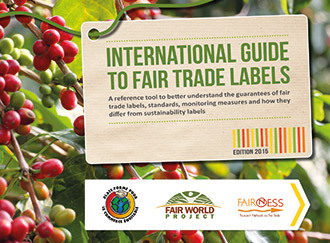 In order to clarify the specifics of assorted fair trade label demands, the guide also compares them with other initiatives which are sometimes confused with fair trade labels, particularly because they certify the same kinds of commodities (such as sugar, cocoa and tea) and because brand marketing often intentionally associates them with fair trade. The comparison includes the following five sustainable development labels: 4C Association, Bonsucro, ProTerra Foundation, Rainforest Alliance and UTZ Certified. Finally, the guide summarizes the main aspects of academic research regarding the identified impacts of the different fair trade labels and sustainable development labels. I am a fair trade activist and work with others here in Mankato, MN to educate about Fair Trade. I am interested in purchasing the Guide. Please let me know the details of cost and how to order. Many thanks! Will this publication become available in some digital format? I thinkMartin is referring to a digital version of the guide itself. The link doesn´t take you to the International Guide, does it? ?